The Nikon D7200 accepts most modern SD cards, including SDHC and SDXC cards, and takes advantage the speed boost from UHS-I (Ultra-High Speed Type I bus) cards. For a broader explanation of SD card types and designations, see my prior article Demystifying SD Cards. 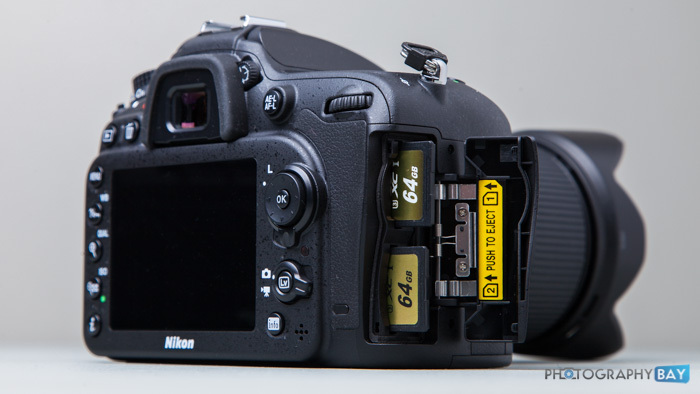 Below, I have tested a few different memory cards in the Nikon D7200 to demonstrate the positive effects of buying a more capable memory card and to highlight some specifications of particular cards that might make them a better fit for the D7200 and similar cameras. With each card, I performed three tests in camera and one test on the computer to help verify the numbers and performance we see in camera. The initial burst is often cited as the biggest spec feature and I have it listed, along with the frame rate provided. Additionally, I spell out what happens after the initial burst in terms of continuous frame rates after things slow down. The final numbers show the actual sustained read and write speed to read and transfer a 1GB file using the Lexar Professional Workflow HR2 Hub with the UHS-II Card Reader connected via Thunderbolt to my iMac. File sizes average at roughly 26MB for .NEF raw file and about 13MB for .JPG files. For the money, the Transcend 64GB UHS-I Speed Class 3 card (with the 85MB/s write speed label) is one of the best cards you can get now for UHS-I devices. Of course, the place where you will see a serious advantage with the Lexar UHS-II card is during import. If you are using the included UHS-II card reader or the Lexar Professional Workflow HR2 Hub with the UHS-II Card Reader, then your transfer speeds are going to be blazing fast and save you time managing media. Lexar’s UHS-II card really isn’t that much more than the fast UHS-I cards out there, so the post-production benefit may be well worth the additional cost. Too bad the Canon 5D Mk3 has such slow SD speeds. I still prefer CF cards, even though I know one day they will be replaced by something smaller. I’ve been using CF cards for over 15 years, and only had one ‘bent pin’ issue. That was with a small CF reader I had in my pocket, and something small got in the slot, I didn’t notice and a pin got bent when inserting the CF card. Technically, Compact Flash technology has always been better than SD technology, but the form factor (size and pins) is its only disadvantage. I can’t wait for CFast to become the new standard. There are several mirrorless system cameras with UHS-II support but zero DSLRs . I guess Canon, Nikon and Pentax just enjoy selling their cameras to their aging base. Agreed. Canikotax really need to jump on the bandwagon.